Stearns Park is a focal point in Ludington, where so many people gather for a number of activities. This is the city's largest beach, with 2,500 feet of sandy shoreline and plenty of FREE parking. Here you can swim, build a sand castle, and enjoy the view of the Ludington North Breakwater Light, open for tours in the summer. The half-mile walk out to the light is popular among couples, families, and fishermen. There are no lifeguards, but beach patrol officers are on duty from 11am-8pm. There is also free Wi-Fi at the park. Three accessible walkways have been constructed at both the north and south concession stands...as well as in the middle of the beach. Wheelchairs, strollers and anyone who has trouble walking through the sand can now use the walkway to get down to the water from the parking lot. Various donors purchased the boards that make up the walkway, with messages and names inscribed on each board. 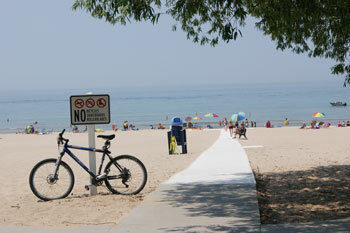 Stearns Park Beach has been voted the fifth most accessible walkway in the nation! 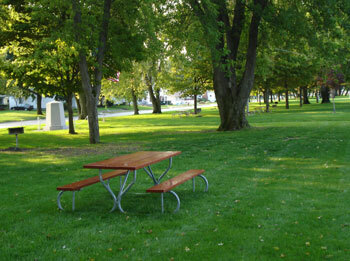 Across from the beach and Stearns Drive is a large, grassy area with picnic tables and grills. This is a beautifully shaded area, and many parties and reunions are held here. When you want to escape the sun and the heat, this is a wonderful place to spread out your blanket and catch a few winks! Concession stands are found at both the north and south ends of Stearns Park, and carry all your favorite snacks and beverages. You'll also find restroom facilities here, as well as drinking fountains. The angled FREE parking at Stearns Park which looks out over Lake Michigan makes it ideal to sit in your vehicle during the colder weather and watch the spectacular sunsets. Professional and amateur photographers choose this setting to capture the ultimate beauty of Ludington's premier park. The North Breakwater Light stands proudly at the beginning of the harbor, and everyone loves to walk the half-mile breakwater to either visit the Light or watch the S.S. Badger sail by. The Light is open for tours in the summer time, and for a $5 donation, you can climb to the top. The south end of Stearns Park is a flurry of activity--especially at the Skate Plaza. Kids of all ages gather here with their skateboards and in-line skates. On one side of the Skate Plaza is the shuffleboard courts, and the other side features the Jaycees Mini Golf Course. To the south of the concession stand you'll find a nice playground for the kids on the sandy beach. The concession stand is next to the entrance to the long outer breakwall out to Ludington's North Breakwater lighthouse.